Please advise where a new one can be bought. The machine is no longer under contract so we need to purchase a new waste unit for toner. Thank you. Our waste toner unit is full. Thank you for your question. Unfortunately we do not sell this item. I would advise that you contact Ricoh directly. Built for small to medium-sized offices, the Ricoh Aficio MPC2051 printer aims to be a versatile, fast, and intelligent multifunction device with colour printing and faxing capabilities, making it ideal for producing the highest quality business correspondence. The Ricoh Aficio MPC2051 colour laser printer is highly secure, too. Finishing options help users save time, but its uses a printing process that seems sub-par to the quality of actual laser printers. The Ricoh Aficio MPC2051 multifunction colour copier is designed to be a floor-standing device when stacked with additional paper trays. It is compact and does not demand much installation space. The topmost area is home to the flatbed scanner with the ADF, and that is adjacent to the large control panel with the 8.5-inch LCD screen. The MPC2051 printer runs on a 600MHz processor with a 160GB hard disk drive and 1.5GB of RAM. The Aficio MPC2051 prints using the dry electrostatic transfer method. Two-sided printing, versatile finishing options, and the 50-sheet automatic document feeder contribute to savings. The eco-friendly Ricoh Aficio MP C2051 is energy-efficient and easy to operate with the intuitive and animated colour LCD display screen. The maximum paper supply can be increased up to 1,600 while different kinds of media from envelopes to labels and laser printer-friendly transparencies are supported. 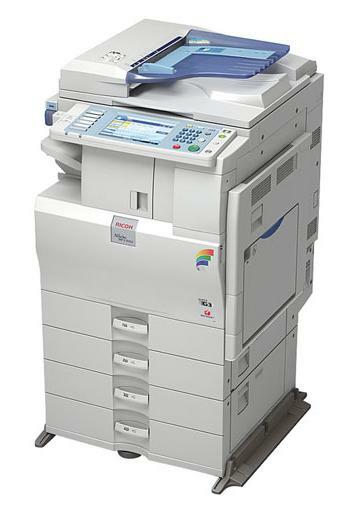 The Ricoh Aficio MPC2051 colour multifunction system offers versatile connectivity and network interfaces, as well as high-end security features. Ricoh MP C2051 toners are fairly cheap and cost-effective, ensuring that this colour laser MFP is the ideal solution for low-cost colour output in an office environment. Print speeds are not at par with laser printers, clocking in at a maximum of 20ppm in both colour and black-and-white. The Ricoh Aficio MPC 2051 takes time to warm up from power on, and when printing, the copy resolution is only limited to 600x600dpi. The high initial cost of the Aficio MP C2051 laser printer could disappoint the budget-conscious. The device is very heavy, weighing 100Kg.